Guitarist Bernie Tormé has died at the age of 66. 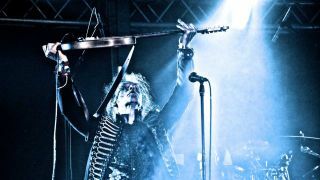 The news was confirmed in a statement from Tormé's family, who said, "Bernie Tormé passed away peacefully on the 17th March 2019, one day short of his 67th birthday, surrounded by his family. He had been on life support for the past four weeks at a London hospital following post-flu complications. After forming the Bernie Tormé Band two years later, he re-joined McCoy as a member of former Deep Purple singer Ian Gillan's new solo project, playing on four Gillan albums: Mr. Universe, Glory Road, Future Shock and Double Trouble. In 1981 Tormé left Gillan, and joined Atomic Rooster as a session guitarist. The following year briefly joined Ozzy Osbourne's band, stepping in for Randy Rhoads in the aftermath of the guitarist's tragic death. Ozzy Osbourne told Total Guitar that if it wasn’t for Bernie Tormé he “might never have got back on a stage”. Snider tweeted, "Woke up to find out my friend @Bernie_Torme has died. He was a guitar god who played with @OzzyOsbourne & Ian Gillan. We worked together for 3 years, writing over 100 songs for the ill-fated Desperado. I loved that man & today my heart is broken. RIP Bernie. Your guitar weeps."